Hydrangea (common names hydrangea or hortensia) is a genus of 70-75 species of flowering plants in the Hydrangeaceae family, native to southern and eastern Asia (China, Japan, Korea, the Himalayas, and Indonesia) and the Americas. By far the greatest species diversity is in eastern Asia, notably China, Japan, and Korea. Most are shrubs 1 to 3 meters tall, but some are small trees, and others lianas reaching up to 30 m by climbing up trees. They can be either deciduous or evergreen, though the widely cultivated temperate species are all deciduous. 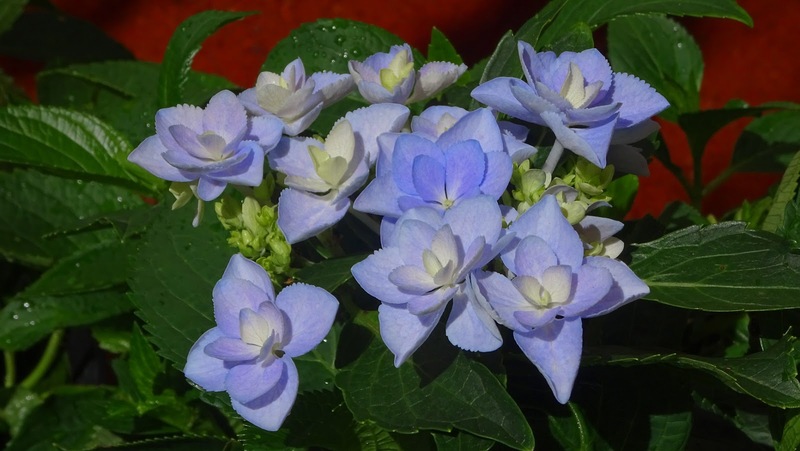 Having been introduced to the Azores, H. macrophylla is now very common, particularly on Faial, which is known as the "blue island" due to the vast number of hydrangeas present on the island. Species in the related genus Schizophragma, also in Hydrangeaceae, are also often known as hydrangeas. Schizophragma hydrangeoides and Hydrangea petiolaris are both commonly known as climbing hydrangeas. 1) Mophead flowers are large round flowerheads resembling pom-poms or, as the name implies, the head of a mop. 2) Lacecap flowers bear round, flat flowerheads with a centre core of subdued, fertile flowers surrounded by outer rings of showy, sterile flowers. The flowers of some rhododendrons can appear similar to those of some hydrangeas, but Rhododendron (including azaleas) is in a different order. In most species of hydrangea the flowers are white, but in some species (notably H. macrophylla), can be blue, red, pink, light purple, or dark purple. In these species the colour is affected by soil pH. For H. macrophylla and H. serrata cultivars, the flower colour can be determined by the relative acidity of the soil: An acidic soil (pH below 6) will usually produce flower colour closer to blue, whereas an alkaline soil (pH above 6) will produce flowers more pink. This is caused by a colour change of the flower pigments in the presence of aluminium ions which can be taken up into hyperaccumulating plants. Seen here is the Hydrangea macrophylla 'Forever' hybrid. It is from the ‘You and Me’ series, and is a sturdy hybrid featuring lacecap like flowerheads when they first start to open but as they mature the central florets also open creating a complete mophead of double pale pink or blue florets. A deciduous shrub of a compact habit. Best grown in neutral/ alkaline soils. I love Hydrangeas, especially the blue. There grow a lot of them in my garden. Lovely! I am familiar with the "mopheads."